The first National Class Regatta for the Footys really was a great event which I thorougly enjoyed despite a raging head cold. Darrell and his crew of organisers did a very good job of keeping things moving along and keeping the skippers happy. The courses set worked out well by using a basically rectangular course to spread the beating and running boats out. At times the distant marks were well out there which I like, gives you a sense of going somewhere. 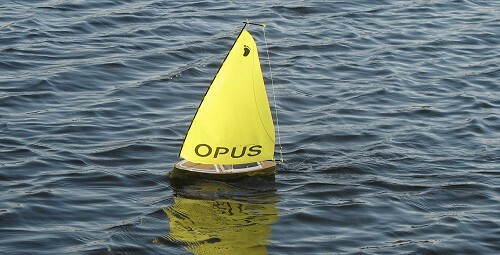 As planned I sailed one of the new Pond Sprites which I had built for the event. I chose my ‘working’ size ‘A’ rig as the winds were pretty variable from very light to a stiff blow with strong gusts during each day. There were times when this was just simply too much sail area and the result was the occasional broach and moments out of control when a bad gust would hit while on the run downwind. Beating into and across the wind the boat handled the wind strength with no problem. But as a few skippers discovered again, even these winds were nowhere near enough for the tiny ‘B’ rig to be of any use so changing to the ‘B’ was not an option in my opinion. Saturday started with light winds for just the first race or two then increased to give good racing with occasional gusts which created a certain amount of chaos in the fleet. I must admit that I sailed poorly on the Saturday and made some mistakes the most significant of which was to get totally confused after a course change and actually stop racing while in second place because I thought that I had finished! By the time I realised my mistake and returned to the course my 2nd place was a 10th place… very embarassing and costly in the end! By the end of Saturday I was in 7th place and not particularly impressed with my performance! The Pond Sprite was great though and came through from poor starts to good finishes on several occasions so I know it was better than I was. Pond Sprite (yellow main) makes another poor start. Sunday again started very light and flukey which I must admit are conditions I like. I won the first race which bucked me up no end and set me off on a much better days racing. Pond Sprite won two other races including the last, took two seconds and three thirds as I remember. By the end of the day I was very happy to take 5th place overall with 51 points, just 2 points behind 3rd and 4th which both had 49 points. Actually I wish that I had been further behind because now my mistakes on Saturday really hurt! Anyway the prize giving was fun and full of laughs which I think pretty much summed up the whole weekend. Once again it was good to meet up with old friends and make some new ones over the weekend, here’s looking forward to next time. I was pleased to see my friend Ed Rohrer finish in 8th place with his Kittiwake K1.5 (that’s an early Kittiwake with a K2 rig). The photo above is Ed and me looking over his set up. I have had a few questions about compatibility between the original Kittiwake kit and the new Kittiwake K2. Probably the most important aspect being whether the sails and rig of the K2 will fit on the earlier boat. The simple answer is yes, with a few small modifications. The mast is the same diameter on both boats so the new rig will drop straight into the mast socket in the earlier Kittiwake. However to handle the larger jib sail it will be necessary to add a bowsprit to the hull. To do this you must first remove the brass screw eye at the bow. Then sand off the finish on the raised deck support strip so that a wood dowel bowsprit can be epoxied in place. The bowsprit is 3 1/2″ long and 1 1/2″ will project in front of the bow. Sand or file a flat on the bottom of the bowsprit to give a larger gluing area and epoxy it down. Add a couple of small brass screws if you like. That’s really all there is to it. The hulls are the same so you can expect the balance of the converted Kittiwake to be the same as a K2. 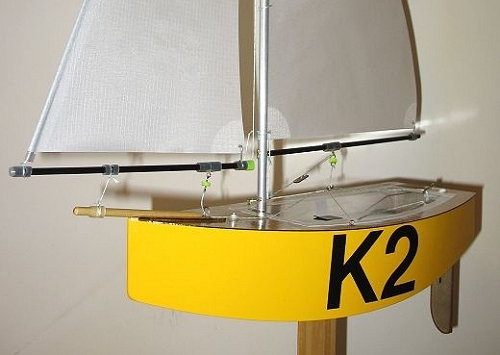 The keel of the K2 is a little longer with the same 7oz keel weight so a K2 will be a little ‘stiffer’ and able to handle a little more wind than a converted Kittiwake. This is not really a problem though because you can quickly change back to the original sails and rig by making a new jib pivot thread which will then slip over the bowsprit. The control line guides for the main and jib booms all stay in the same place. You will just need to make sure that the lengths of the lines work for both rigs by adjusting the K2 rig connections to suit. There are a group of proposals currently being voted on by registered Footy Class members. None of the changes if they are accepted will impact the Class legality of either the Kittiwake or the Kittiwake K2. The most significant is if the 4x AA battery restriction is lifted. If an owner changes to lighter batteries in our designs the performance will not be adversely affected. Lowering the overall weight in this way will automatically improve the ballast-to-overall weight ratio and make the boat a little stiffer. I would most likely stay with the heavier batteries in many conditions because it looks like a little more inertia is a good thing in footy racing. If the rig choice rule is changed the kit rigs will be unaffected and the alternative rigs available as free download drawings at our web site will still all be relevant. We will always add details of more rigs as I make and test them. So come what may you will continue to be able to enjoy the extra fun of class racing your ScaleSailing footy.